Germany’s Chancellor Angela Merkel is directly responsible for the murders of her citizens in the four jihadi attacks in Germany in the last week. 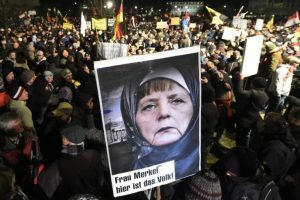 Merkel’s continual defense of Islam in the face of objective reality they are working to overthrow non-Islamic governments including her’s, the Syrian Muslims she continues to bring into Germany in record number – calling them “refugees” even though they do not meet the international/legal definition of “refugees,” and her gross disregard for the security of Germany despite warnings from security officials in and out of Germany (including UTT) have all brought this explosive jihad to the heart of Deutschland. The last of this string of attacks came over the weekend (Sunday) when a 27 year old Syrian Muslim male blew himself up in Ansbach, Germany wounding at least 12 Germans. This followed an attack earlier Sunday when another 21 year old Syrian Muslim male used a machete to kill a pregnant woman in Stuttgart. On Friday an 18 year old Iranian Muslim shot and killed nine people in a shopping center in Munich, and a week ago (Monday) an Afghan Muslim male used an axe to attack and wound two people on a train near Wuerzburg, Germany. Even Chancellor Merkel might see there is a trend among these incidents. 100% of Islamic doctrine mandates jihad until the entire world is under Islamic Law (Sharia). All of sharia understands those who migrate into non-Muslim lands are called Muhajiroun – those who emigrate in the cause of Allah. This is a form of jihad and is, according to the International Muslim Brotherhood, the 5th of 6 stages in conquering non-Muslim nations. In Sharia there is no understanding of gratitude or mercy for the acts of non-Muslims towards Muslims. From the Islamic perspective, the actions by the leadership of Germany – specifically Angela Merkel – demonstrates weakness and submission to Islam and, therefore, Muslims must respond with more force because they must wage jihad when they have the strength and ability to do so. When the enemy of Muslims signals they are weak, Muslims must respond strongly. It is a good lesson for U.S. leaders who believe appeasing the Muslim population and “working with them” to find a solution to “terrorism” is a good idea. “In Sharia there is no understanding of gratitude or mercy for the acts of non-Muslims towards Muslims…(and) demonstrates weakness and submission to Islam.” So many Westerners thinking on this is tangled up in their ethnocentric multiculturalism. They do not know NOR want to know that Muslims are NOT just like us. Thank you!!! This is a massive piece of information. I have know this to be true forever. I also believe that our nation is being completely dupped, as has Germany, about peace loving Islam intent. Barack H. Obama is in my mind just what Angela Merkel is, sympathetic to Muslim cause. The real difference is that Obama is in reality still the Muslim he was brought up to be. Once a Muslim, always a Muslim!! Eyes open!!!! “Skepticism” is generally defined as an attitude of doubt or disbelief toward one or more putative issues; albeit the existing outright denial of demonstrable fact related to Islamic terror in Germany is in a class of mental derangement all by itself! Furthermore, for the current Chancellor there to have emphasized to TIME magazine the value she places on “DATA” (derived e.g. from the study of quantum mechanics) as evidence of her leadership skills & of understanding the “Global Islamist Movement” which is currently engaged in an existential war with her country (relevant to which, in actual fact, she either knows nothing, or has what surely must otherwise be a personal agenda clearly unrelated to preventing more German citizens who she’s obliged to protect from being slaughtered by jihadist savages, at will, and all over the country. Too, were I German, I would hasten to ask the Chancellor whether or not she’s been tutored (perhaps from abroad) to illegally endanger and/or squander more lives in the interest of some sort of maniacal cause. And since her muddled beliefs aren’t remotely related to the reality of Islam — who stands to benefit by virtue of her political grip on the country, and in what way, and to whom, are any such “benefits” designed to accrue. All of the media in America and the EU are vital to our cause of repelling and vanquishing the Islamic world-wide jihad. I ask that UTT develope a program specifically designed to help the most friendly of the media to educate the general public to the things that you use here on your site. Let’s face it, the general public on both sides of the Atalntic have no clue that UTT exists, and they have information that is being fed by jihadi Muslims to a lazy, politically correct collection of ignorant news people. UTT needs to cultivate the friendly news outlets day in and day out to amplify their helpful approach to the Islamic threat. about our war with Islam.